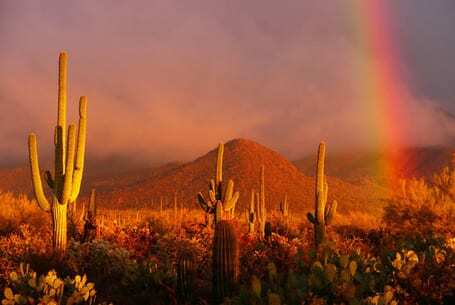 Saguaro National Park has long been committed to recycling plastic and aluminum, saving 61,500 pounds of recyclable waste from landfills in 2010 alone. However, transporting disposable bottles to be recycled also costs money, time and gasoline. The park could eliminate up to 40% of what is currently recycled; about 15% of the park’s total waste stream. Saguaro conducted a thorough analysis of the potential impacts of eliminating the sale of disposable bottled water and soda, and determined that the more sustainable solution is to provide new water bottle filling stations for visitors to refill their own reusable containers. “The use of disposable plastic bottles has significantly greater environmental impacts compared to the use of local tap water and re-fillable bottles”, said Superintendent Darla Sidles. “Implementing this action will help the park reduce its environmental footprint”. There are new water bottle filling stations located at each visitor center as well as the Rincon Mountain District bike ramada. BPA free, reusable water bottles are available for purchase in either visitor center. Photo by Cecilia Lim H M/Shutterstock.